CINCINNATI -- Sept. 18, 2002 -- Chicken Dance Elmo is about to get the royal treatment from the City of Cincinnati. Chicken Dance Elmo -- a captivating new toy from Fisher-Price and Sesame Street -- is expected to make a special appearance before Cincinnati City Council at council's regular weekly session Wednesday, Sept. 18, at Cincinnati City Hall. City Council is expected to vote unanimously on a resolution officially recognizing Chicken Dance Elmo as an ambassador for Oktoberfest-Zinzinnati and the City of Cincinnati during the upcoming weekend when Cincinnati hosts the nation's largest Oktoberfest, attracting 500,000 revelers. 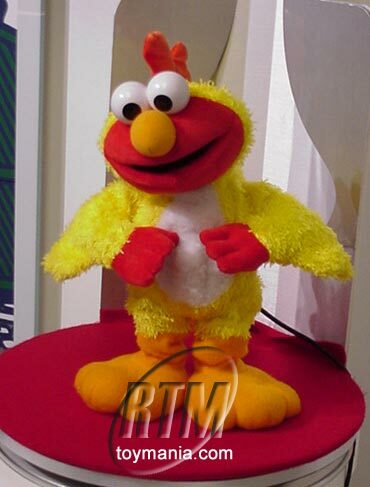 As a bit of appreciation, Chicken Dance Elmo will then perform the Chicken Dance from a podium in council's chambers. Chicken Dance Elmo is being welcomed to Cincinnati as a prominent player in the Lowenbrau World's Largest Chicken Dance and Kazoo Band -- the highlight of Oktoberfest-Zinzinnati set for Sunday, Sept. 22, at 4 p.m. on historic Fountain Square. Verne Troyer, the pint-sized star of "Austin Powers," will lead the Lowenbrau World's Largest Chicken Dance and Kazoo Band from the Chicken Dance Elmo Stage. A draft of a resolution to go before City Council at Wednesday's session reads in part: "Whereas, Chicken Dance Elmo serves as a fitting ambassador for Oktoberfest-Zinzinnati and our great city, exemplifying the spirit of 'Gemuetlichkeit,' bringing smiles to people of all walks of life and bringing people together to do the Chicken Dance on historic Fountain Square." Chicken Dance Elmo was recently named one of the top new toys at the International Toy Fair in New York City. The 2002 Oktoberfest-Zinzinnati will be held Saturday and Sunday, Sept. 21 and 22, on five blocks of Fifth Street -- stretching from Race Street and historic Fountain Square to Broadway in Downtown Zinzinnati. The hours: 11 a.m. to midnight Saturday and 11 a.m. to 10 p.m. Sunday. Admission is free. For more information, the public should go online at www.oktoberfest-zinzinnati.com or call (513) 579-3191.